WHY GO TO NEW CALEDONIA? New Caledonia is a French overseas territory located in the Pacific Ocean, a couple of hours of flight east of Australia and just north of the Tropic of Capricorn. Its capital is Numea and its territory consists in a main island called Grande Terre, about 400 kilometers long and about seventy meters wide, while a little further to the east there are the Loyalty Islands (Ouvea, Maré, Lifou and Tiga) an archipelago of large atolls, most of them "raised" above the sea level. Further south there is Ile Des Pins (Isle of Pines), an island of calcareous rock about twenty kilometers long and wide. Around the major islands and along the channels that separate them, there are dozens of small uninhabited atolls and coral reefs which create a rich environment with a great biodiversity quite unique in the world. A trip to New Caledonia is therefore particularly recommended for those who love beautiful sea, wide sandy beaches and crystal clear lagoons, for those who want to admire seascapes and for those interested in observing endemic species that include particular birds, trees, corals and fish. New Caledonia is not yet exploited by mass tourism, so the destination is ideal for those looking for a quiet destination far away from the crowds. WHAT TO SEE IN NEW CALEDONIA? Overall, the territory of New Caledonia is quite extensive, with numerous tourist attractions spread over great distances that can't be covered quickly. Being able to see everything in a single trip can be challenging and, unless you have many weeks available, it is better to concentrate first on the places you are most interested in, then come back to see the rest. So let's see, first, what are the main things to see in New Caledonia, so you can create an itinerary more suited to your tastes, depending on the time available. The Grande Terre. Due to the presence of the only international airport serving the country, all trips to New Caledonia will start and finish on the Grande Terre, but considering the main island only a simple stopover is very reductive, as the place offers many attractions in terms of landscapes and biodiversity, which will fascinate the most curious travelers. Translated literally, "Grande Terre" means "big land" and can be easily visited by rental car, spending each night in a different place. You will find a comprehensive travel guide about Grande Terre on this site, with all the places not to be missed and the related photos. Noumea. The administrative capital of New Caledonia, Noumea (or Numea), is a quiet city of one hundred thousand inhabitants, with a beautiful coastline, a fantastic aquarium and some interesting museums. A series of small islands and coral reefs can be found a few minutes by boat from the city and can be explored by mask and fins. You will find more info and photos about Noumea in this web site. The Loyalty Islands. Known as Iles Loyautè in French and Loyalty Islands in English, is an archipelago located less than one hour flight east of Noumea and includes the islands of Ouvea, Maré, Lifou and Tiga, as well as a series of small atolls and coral reefs, sometimes without a name, that arise in the sea between the main islands. Ouvea looks like the classic Pacific atoll that reflects the perfect tropical postcard: a long strip of land surrounded by a crystalline lagoon among one of the most beautiful in the world and UNESCO heritage site, featuring a 16 miles long beach of fine white sand which can be entirely walked barefoot. Maré and Lifou are instead "raised" coral atolls, so called because the tectonic thrust has pushed them tens of meters above the sea level, creating an intriguing unique mix of white sandy beaches, tall rocky cliffs and Araucaria forests that create an incredible background to turquoise lagoons. Isle of Pines. Ile Des Pins (in French), is located 20 minutes flight from Noumea, south of the Grande Terre, and is so called for the forest of Araucaria columnaris (a tree that looks like a pine) that covers most of the island. The landscape becomes particularly unusual for a tropical location, as these conifers can be found around beaches and lagoons, creating a surreal and primordial atmosphere that looks like a mixture between alpine and tropical environment. The Isle of Pines is the most famous tourist attraction in New Caledonia and therefore the most exploited in terms of tourism. 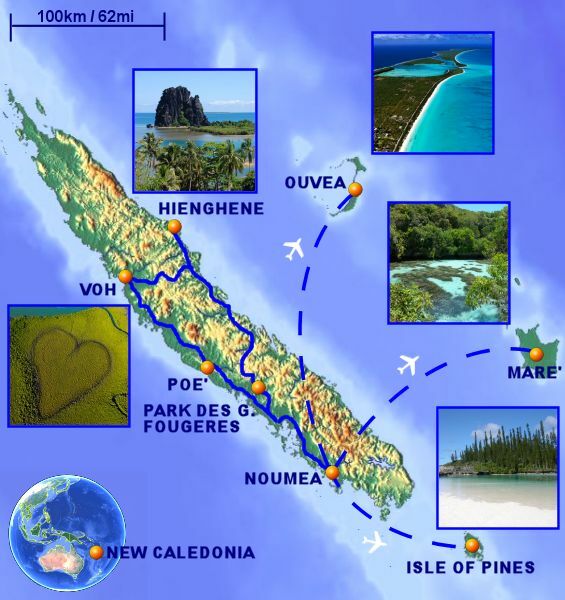 HOW TO GET TO NEW CALEDONIA? New Caledonia is linked with daily flights to Japan, most of them operating onto Tokyo Narita airport or Osaka, and with Australia, mainly onto Sydney. Several flights per week, especially in high season, are available also onto Auckland (New Zealand), Nadi (Fiji Islands), Port Vila (Vanuatu), Papeete (French Polynesia), Melbourne and Brisbane (Australia). Visitors coming from Europe may find more convenient the Japan route, as Aircalin, the flagship airline, offers same-day connecting flights that can be issued on the same ticket of the flight from Europe to Japan: this is possible thanks to agreements with Airfrance, Alitalia and some other European carrier. Passengers coming from the western hemisphere may find more convenient flights via Auckland or Sydney, or even via Nadi or Papeete, although these can be much more expensive. All the international flights operate onto Noumea La Tontouta airport (IATA code is NOU), located about 50 kilometers from Noumea city on the Grande Terre island, while most internal flights are available only onto Noumea Magenta airport (IATA code is GEA), located in Noumea downtown. This means that if the final destination is Isle of Pines or any of the Loyalty Islands, a transfer between the airports (and perhaps an overnight in Noumea depending on the schedule) will be necessary. There aren't other airports in New Caledonia getting international flights. New Caledonia is also occasionally visited by cruise ships operating from Australia, New Zealand and Melanesia, but the schedule usually allows only a few hours on each island, a very short time which will not let to appreciate the full beauty of the country. HOW TO MOVE AROUND IN NEW CALEDONIA? The islands belonging to New Caledonia are quite extensive, apart from the Grande Terre, which is more than 400 kilometers long, even the smallest Ouvea, Maré, Lifou and Ile Des Pins have relatively large distances, which can not be covered by bicycle or on foot, while public transport is almost non-existing. We therefore recommend renting a car, a possibility offered on the Grande Terre island both by world's major car rental chains and also by small local operators, such as Point Rouge. Instead, on Loyalty Islands and on Isle of Pines, the car can be usually rented by asking directly to the structure where you are staying, but taking care to make such request when you book accommodation, as the number of cars available is very limited (do not wait last minute or when you already arrived). If you decide not to rent a car, an option that we do not recommend, the transfers between the airport and the accommodation where you stay can be organized by the accommodation itself, which can also provide day tours with a guide to see the most distant attractions (an option in any case required if you wish to visit remote places that can only be reached by boat or through long dirt roads). Transfers between Noumea and the other islands are available through the regional local airline, Air Caledonie, which operates a fleet of ATR-72 and Twin Otter planes, capable of covering the distances in about half an hour. Several flights per day are available to and from the Loyalty Islands and Isle Des Pines, even during holidays but, as already said, they usually operate onto Noumea Magenta airport (located in Noumea downtown), not onto the more distant international airport. One thing to keep in mind is that to move between minor islands, there aren't direct flights, but Air Caledonie usually requires to go back to Noumea each time, before continuing to the final destination. This could be even OK as the flights are very short, but unfortunately the schedule is not optimized to allow fast connections, so it is quite common that passengers will have to spend lot of hours in Noumea Magenta airport (even a whole day) waiting for the connecting flight. On the other hand, Air Caledonie offers carnet of tickets at discounted fixed rates, which are relatively cheap when you want to visit multiple islands. Generally these carnet of tickets are not available through travel agencies, but you must contact the airline directly by phone or through their web site. Alternatively, it is possible to travel between Loyalty Islands, Ouvea direct to Lifou and Lifou direct to Maré, by Air Loyauté, although there are only few flights per week and still requiring a long stop-over in Lifou if you want to move from Ouvea to Maré. WHERE TO STAY IN NEW CALEDONIA? Except in the capital Noumea, where a large number of hotels are available, the availability of accommodation throughout the rest of the country, is quite limited, therefore it is recommended to plan and book well in advance, especially during holidays and high season. Although some high-standard resort is available on Isle of Pines and a few can be found also on the Loyalty Islands, for our trip we preferred to choose middle class accommodation, between 2 and 3 stars, as we usually don't like too sophisticated structures specifically built for tourists. Surprising, in the 2 or 3-star accommodations where we stayed, for which you will find links in the various pages of this travelogue, we have always found all the comforts such as air conditioning, hot water, free wifi, clean sheets, electricity and also a small kitchen which allowed us to be self-sufficient with meals (for a considerable savings compared to eating each time outside). For those interested in trying a different experience, an option which may lead to further considerable savings, is to stay in the classic "tribal huts" built on the traditional Kanak architecture (in essence, a hut with mattresses on the floor). In the pages where we talk about Ouvea and Maré, you will find links to book this kind of structures (New Caledonia tribal accommodations). HOW LONG TIME IS NECESSARY TO VISIT NEW CALEDONIA? Given the distance of New Caledonia from Europe or America and therefore the length of the journey with its related costs, considering also the size of the country with the attractions scattered on huge distances, we recommend choosing this destination only if you have at least 3 full weeks available for your holiday, even better a whole month (an exception may be for visitors from Australia or New Zealand, as the length of the journey to get to New Caledonia is much shorter). To visit the Grande Terre, including Noumea and the north-eastern / north-western coast, visitors need to plan a minimum of 7 days, which become 10 adding the national parks and attractions south of Noumea (we are still talking about minimum stays: if you want to make additional excursions in each place, like boat trips in Poindimié or Poe, you need to add more time). To visit Isle of Pines and the Loyalty Islands (either Maré, Ouvea and Lifou), we recommend to stay no less than 4 nights on each island to be able to enjoy most of the attractions and relax on the beach for sufficient time. In the brochures of the various travel agencies selling New Caledonia trips, you will certainly find itineraries that promise to visit all the islands in a short time, staying 1 or 2 nights on each island, while it's not uncommon to meet tourists who arrived from Noumea by plane for a short day tour in Isle Des Pines or in Loyalty Islands, departing back to Noumea the same afternoon. We strongly advise against this type of tourism because, although theoretically you can quickly see "everything" (providing that the weather will stay on your side) you can not appreciate the places in all their beauty, or the landscape changing constantly depending on tide and time of day. WHAT IS THE SUGGESTED BUDGET FOR AN HOLIDAY IN NEW CALEDONIA? Rent a car instead of paying for transfers from/to airport or for day tours each time. The car will also allow you to reach the various attractions in economy and freedom of schedules (the cost of the rental including insurance, is similar or slightly higher than other parts of the world). Eventually, the car can be rented only on days when you want to go around. WHAT IS THE BEST TIME TO VISIT NEW CALEDONIA? Since a vacation in New Caledonia is mainly a naturalistic trip, with so many hours spent outside swimming and hiking, you're probably wondering what is the best season to visit New Caledonia, which can offer a better climate in terms of sun and temperature. New Caledonia is located in the southern hemisphere and relatively far from the equator, therefore we can distinguish two main seasons: a cooler and more dry time between July and October, and a warmer and more humid time between December and May. The best time to go to New Caledonia is probably during late austral winter, with September being statistically the driest month (however we must not forget that in the Pacific, even during the dry season, rains are always possible and sometimes they can be also long). During this period the temperature is very mild, without extremes, with daytime highs that can reach 25 degrees centigrades and nighttime minimums around 15-18 degrees centigrades, an ideal condition for long walks or for spending many hours on the beach. During this time of year, the average water temperature is around 23 degrees centigrades, with considerable variations depending on the tide. We found the warmest sea in Ouvea and the coldest in Isle of Pines. Even the air is typically drier in the surroundings of Ouvea, while the wettest areas are those along the east coast of Grande Terre and around Isle of Pines. The drawback of the dry season is the drier vegetation, with less greens, less flowers and less wildlife like birds and reptiles, but it's the best season to see whales, especially off Maré and Lifou. It is also best to always carry a light sweater, to be dressed in case of cool wind or after sunset. The rainy season in New Caledonia is probably the worst time to travel, especially between February and April, while the weather may be still quite acceptable in December, if you are interested to spend here the Christmas holidays. The advantage of traveling this season is mainly for a higher water temperature, which can exceed 28 degrees centigrades, and from being able to observe a more luxuriant vegetation, with many birds and other endemic species unique in the world. Obviously the air is warmer, sometimes even too hot, so you can leave your sweater at home. April is the month more prone to cyclones, although these events are quite rare and far from happening every year. Power plugs The power sockets in New Caledonia are like the French ones (two round pins, as in most of Europe). Do not forget the adapter even for the other countries where you will transit, like Australia or Japan. Wifi in New Caledonia Most accommodations provide free Wifi, with a relatively good signal quality. Sometimes the Wifi is available only in the common areas of the hotel, while in other cases, only a small number of megabytes per day are provided free of charge. Smart-phone and mobile network Although most foreign mobile phone operators say to provide roaming in New Caledonia, we have found total absence of service, even in the capital Noumea and even if you pay for roaming packages. We recommend to buy a Sim card with a local operator, or use only the wifi at the hotels. Money and credit cards The official currency in New Caledonia is the Pacific Franc (CPF), used also in French Polynesia and Wallis & Futuna islands. When changed with Euro at local money exchange counters, the conversion rate is very similar to the official one, while with the US or Australian dollar, the exchange rate is much less advantageous. Each time the money is changed, a fixed commission is added too, so it is good to change all you need at once (unused Pacific Francs can be changed back to the original currency by presenting the change receipt issued the first time). It's best to avoid going to outer islands or remote places on the Grande Terre without sufficient Pacific Francs, as the exchange offices and the ATM machines are not always available. Credit cards are accepted only by major accommodations and are not suitable for daily expenses or to buy something at the supermarket. I say again: do not go to Loyalty Islands without sufficient funds in cash, but change in either Noumea international airport when you arrive, or in Noumea city before getting to the national airport for your connecting flight to outer islands. Official language The official language of New Caledonia is French. English is rarely spoken by the local population and is not always understood even at the major hotels. The local tribes speak a series of dialects deriving mainly from the languages of the Kanak, the Melanesian people of the southern Pacific. Where and what to eat With the exception of a small quantity of fresh food obtained locally (mainly fish), most products are imported, with consequent limits on the variety available and with prices far above Europe or USA mainland's standards. Most of the accommodations offer the classic options for full board or half board, to be reconfirmed from day to day, so that the kitchen can organize the requested meals. The prices are however high and if you are a family, it is probably convenient to shop at the supermarket and cook in your bungalow (most of the accommodations in New Caledonia have a small kitchen directly in the room). Surprisingly for a tropical country with lush vegetation, it is difficult to find fresh fruit and vegetables, while when shopping, you should always check the expiration date on the boxes and bottles, because it is not uncommon to find expired items. The main island of New Caledonia is the ideal place to explore extreme seascapes among an unspoilt nature hosting many endemic species that cannot be found in other parts of the world. Noumea, the only gateway and the main administration centre of New Caledonia offers a nice coast, a huge aquarium museum and a series of atolls where visitors can get to by short boat rides. Ouvea offers a 16 miles long beach of fine white sand that can be walked barefoot for its whole length. A crystalline-clear lagoon, constantly changing with tides and daylight, offers the perfect backdrop for this authentic tropical paradise. Maré is a raised coral atoll, where dramatic cliffs and Araucaria trees make a backdrop to white sandy beaches and turquoise lagoons reach of marine life, perfect to relax for all day. Are we hiking on a tropical island or among the Alps? This is the question that arise while walking among the trails on Isle of Pines, where forests of Araucaria columnaris, a tree very similar to a pine, make a unique landscape together with white sandy beaches and natural pools of turquoise waters.